Dr. Menéndez grew up in the border between Texas and Mexico and is very proud of his dual-culture upbringing. He earned his medical degree from the Instituto Tecnológico y de Estudios Superiores de Monterrey, which is the highest ranked education institution in Mexico and one of the most prestigious in the world, where he graduated with the highest honors. He completed his neurosurgical residency at the Washington University in St. Louis, where he had the opportunity to rotate at the National Referral Centre for Neurosurgery at Beaumont Hospital in Dublin, Ireland. He obtained further specialized training in complex spinal surgery and surgical treatment of epilepsy. Dr. Menéndez specializes in the use of minimally invasive techniques for surgical management of brain and spine problems. He has trained many surgeons in the use of these procedures and continues to help develop better alternatives for patient care through research. He is one of few surgeons in the state that performs surgeries for brain pathologies through less-traumatic and less-invasive options, marrying the most recent advances in technology with surgical innovation and ultimately improving patient care with a safer and faster recovery. He also specializes in surgical treatment of epilepsy. 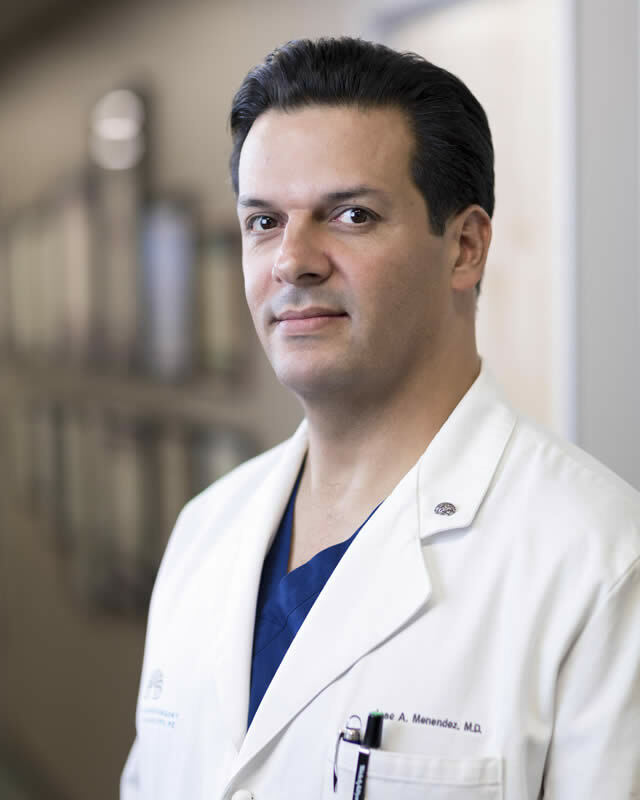 Dr. Menéndez is an assistant professor of neurosurgery at the University of Arizona College of Medicine – Phoenix and serves as the chairman of neurotrauma at Banner University Medical Center in Phoenix. He is board certified by the American Board of Neurological Surgery and is a fellow of the American College of Surgeons. He is a member of the American Board of Neurological Surgeons, the Congress of Neurological Surgeons, the North American Spine Society and the International Society for Minimally Invasive Spine Surgery. "Excellent Dr. The best treatment for my problem. Thank you." "Dr. Menendez is an excellent human being and an excellent neurosurgeon. I was diagnosed with a malignant brain tumor and was told that there was nothing that could be done. I saw him as a second opinion and he was very honest about my poor prognosis, but asked permission to try to give me a better quality of life for the time I had left. I had surgery and now it is one year after and am still enjoying my family and friends, even though I know that the end is near. He went out of his way to try to help me get my wife into the country, and even wrote letters to our senators to help expedite the process. He is just an amazing person and I would gladly recommend him to anyone." "He has very good bed side manner and to me that is the best because you feel important. As you speak to him you feel as though you are the most important thing at that time. He also has a sense of humor. I enjoy my time with him." "I am very thankful that I selected Dr. Menendez for my spine surgery. My overall experience with him was excellent. He guided me through the process in a caring manner keeping me well informed. He is a highly skilled professional and rated as one of the top spine specialist in Arizona."